"Ere boss dyer know what way it is?" ... "Of course it's just down there...""Are yer sure?... Av Utrecht?"Hahaha... Okay, i'll stop with the puns. Liverpool are in the Netherlands for tomorrow nights Europa League fixture against Utrecht and if anyone is going to know the way to the nearest bar it will be former Utrecht star man Mr. Dirk Kuyt, he spent 5 years playing for the Dutch side and still owes his career to them after they gave him a chance to play on a professional level. Dirk Kuyt hopefully however won't be the only traveller who knows a lot about the opposition with Roy Hodgson having to choose a side and tactics carefully as Liverpool look to keep their 100% record so far in the competition. It was an eventful 90minutes to say the least yesterday for all those in a Red shirt and Sunderland were having their fair share of the action too. There was no beach ball this time but a refereeing mishap leading to a goal just as bizarre meant the game got off on a very strange foot. Roy stood by his claims from a few days ago and completely changed the side that he started against Northampton. Reina was back in goal with the four in front of him including Johnson, Carragher, Skrtel and Konchesky. Midfield was made up of Cole, Kuyt, Gerrard, Meireles and Poulsen who was sitting in an even more defensive position than he has been placed in previous games. Torres lead the line. It didn't take Liverpool long to get going after we saw a Torres goal ruled narrowly offside. It appeared we had started with the correct tempo. Liverpool open the doors for Sunderland tomorrow as Steve Bruce's side make the trip to the North West to face Roy Hodgson's deflated side. After being knocked out of the League Cup by Northampton it is not a great feel around Anfield at the moment but Hodgson has dropped clues in an interview that none of the XI who started on Thursday night will feature on the team sheet for tomorrow's game. 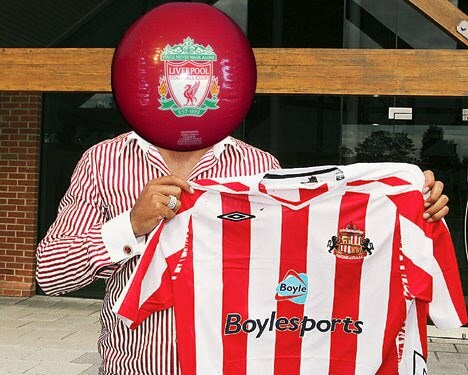 No Liverpool fan will forget a certain Sunderland game last season when a giant inflatable Liverpool beach ball helped along Darren Bent and completely fooled Reina to seal them a 1-0 win. Liverpool of course had the last laugh though in the follow up fixture when they beat Sunderland 3-0, the game included that superb goal from Fernando Torres from a tight angle near the far corner of the box. As Liverpool fans this season will know, the preparation for a very average season was made in the summer and we all knew it would be a tough time for the Reds in their start under Roy. What we couldn't have predicted though was to crash out of the league cup after being beaten by the sole league 2 side left in the competition and in all honesty not even be able to say we played well. As always i shall say it as i see it but if you think your about to read some nonsense excuses or some stories about Rafa or how it's Roy's fault then i'd stop reading now. I'm not here to fuel people's bandwagon, nor am i here to supply ammo for the negative brigade, i'm here to be fair and try to look at things rationally. The Reds face league two side Northampton Town tomorrow night at Anfield and Roy should surely be looking to do well in this competition with the realisation that the Premier League for Liverpool this season is more than out of reach. It would be nice however to see a mixture of youngsters play tomorrow but also a few more experienced players. Would like to see Kelly and Pacheco start, also think Poulsen could do with some game time and players like Babel. Whatever side Roy starts you can be sure it won't be a familiar one. Northampton are currently 17th in the league with 7 points from 7 games. Liverpool find themselves 16th in the Premier League with 5 points from 5 games. Northampton 's last three fixtures read: LWD, for Liverpool it is the exact same reading: LWD, Liverpool's however includes a European tie against Steaua Bucharest. It was a cracker of a game and once again Liverpool proved that they can more than handle the pressure when on display at Old Trafford. Despite an inspired performance from the lads though, the end result was an unfortunate one for Liverpool who fought hard. Roy started Reina in goal with Konchesky, Skrtel, Carragher and Johnson across the back. Midfield was made up of Meireles, Poulsen, Cole and Maxi and it was Torres up front with Gerrard sitting behind him. A slow start for Liverpool meant that United pressure was invited. With several cracks at goal within the first minute and hardly any possession from Liverpool, we looked rather unsteady. So once again we're here folks. The excitement, the nerves, the bubbling hatred for the likes of Gary Neville and Farty Fergie's extra chewing gob. This kind of feeling only tends to come around twice a year and as much as it brings out the worst in me i can't help but absolutely love it. This is what football is all about, the banter, the biggest clubs and the memorable clash of world class players going all out against each other. Of course tomorrow evening i could be in a total different state of mind, quite possibly depressed... But this is the roller-coaster ride that we all have tickets for due to being a Liverpool fan. It was a rather wet and windy setting for Liverpool's game last night against Steaua Bucharest but who needs sunshine to brighten things up when you have the Reds on superb form? It was a mixed team fielded by the boss and it was a side missing the likes of Carragher, Gerrard and Torres. Ngog was given another chance up front and the XI also included academy boys Spearing and Kelly who were more than willing to impress Hodgson and the fans. I was still getting settled and into a comfortable position when Liverpool first decided to raise the eyebrows of everyone watching. After just 30 seconds a very sloppy defensive pass from the Romanians meant Joe Cole could sneakily steal the ball, after making the run his shot wide past the keeper almost seemed as though he had missed the target but his effort found it's way in and Anfield was jumping. It's quite clear that Liverpool have a European history to be proud of but will Steaua Bucharest tomorrow night look back on the match as an achievement or will the beams of jealously begin to emerge as Liverpool get off the starting blocks in the group stages of the Europa League. With the match being shown on channel 5, the KO at 5 past 8, it's a game that will be watched by many a Red. With the pressure on from all of the onlooking kopites can Liverpool get the win desired to send us on our way. Of course, any team you welcome to Anfield you have to fancy our chances but in particular when it is European opposition. This is no Olympiakos in the Champions League but you can still guarantee an atmosphere. Yer wha?! I can't hear yer! It was a tough game yesterday for Liverpool and to be honest by the end of the 90minutes it could have been a less flattering scoreline. Despite the best efforts from the Reds it was the heroics of Pepe Reina that kept our dignity and in turn the point. I did say in my match preview that this away fixture wouldn't be a walk in the park but analyzing Liverpool's chances/play it wasn't particularly fantastic. Roy decided to go with Maxi Rodriguez in place of the injured Dirk Kuyt which i was quite happy to see. The rest of midfield was made up of Lucas, Poulsen and Jovanovic. Gerrard sat behind Torres, Reina in goal and a back four of new man Konchesky along with Carragher, Skrtel and Glen Johnson. Ooo... I could so eat that cake! Well folks, i can't quite believe it but today marks one year since i first started this blog - The Liver Bird. Back in September of last year i had recently finished 6th form coming away with 3 A Levels. The original plan was always to go to university to do Geography as i simply love the subject but due to my A Level grades not being quite high enough to get enough UCAS points i ended up being unable to take the university option. Can Liverpool Come Away With More Than Just The 1 Point? So after what seemed like a hell of a long international break, Liverpool swing back into action on Sunday against Midlanders - Birmingham City. Liverpool were quite lucky in terms of injuries with all the players coming back from duties with their countries in good shape, Dirk Kuyt however was an exception after he injured his shoulder. He is expected to be out for quite a while so this could prove problematic for Roy. Liverpool are also without Fabio Aurelio who is still recovering from an achilles problem and David Ngog also picked up a knock but may still be available for Roy to select on Sunday. As pictured new signing Raul Meireles was also training with the rest of the boys so could most certainly feature in this difficult clash against the Blues. Not forgetting too for the Reds that Joe Cole still has one match left on his ban for receiving his red card at the start of the season. So, the scouser we all love has finally decided to host his testimonial game on Saturday to celebrate 10 years at Liverpool FC. His tenth year at the club was in fact back in 2007 but the 32 year old wanted to wait until he could create an appropriate and one off special football match, something he had always dreamed of, not only this but he always had imprinted in his mind that all the proceeds would go towards his 23 foundation in order to help people and charities in Liverpool. I must confess i had the biggest schoolgirl crush on Carragher, then the biggest teenage crush right up to a sort of now guilty pleasure, he is 32 after all, bit of an age gap going on there Jamie! Haha. Point being, i have followed Carragher closely through his career, he started at the club just as my interest really began and as i grew older i really started to appreciate what a superb example of a footballer he is.